Food is better when it's on a stick! 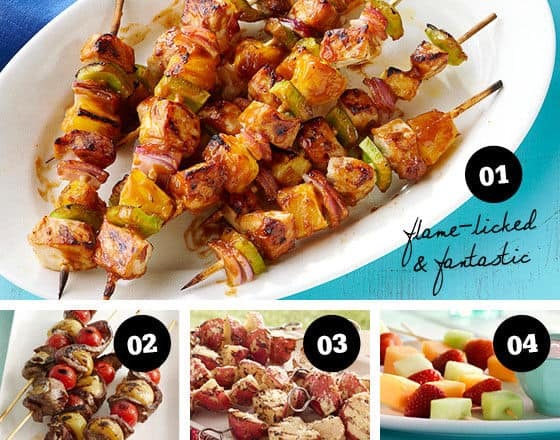 Our partner, Kraft, has put together 12 of the tastiest food on a stick recipes ever! Find all the food on a stick recipes on the Kraft website. FACT: Food tastes better on a stick. No, we can’t explain it. But like love or um, magnets, sometimes the best things can’t be explained with logic. On that note, allow me to introduce the 12 best “stick with it!” foods to eat this summer. Pork and Pineapple Kabobs. While pork and pineapple may sometimes be controversial pizza toppings, there’s no doubt they make fantastic Hawaiian-style kabobs. Ranch-Style Steak Kabobs. Like sticks, ranch dressing also makes everything taste better. You’ve never had a tastier beef kabob. Fruit Kabobs with Strawberry “Margarita” Dip. Reinvent your fruit salad by serving it on skewers along with this dip inspired by the classic summer drink. 5. Corn Cob Pops. Skip those little plastic corn holders, and put your corn on a skewer instead. Plus the spicy, zesty sauce is the best thing to happen to corn since butter. 6. Grilled Fruit Kabobs with Creamy Honey Sauce. You don’t know what BBQ really is until you’ve grilled peaches, plums and pineapples. 7. Sesame Chicken & Pepper Kabobs. Everything you love about cold sesame noodles from the Chinese restaurant (read: the sauce) except with chicken breasts. And peppers. And onions. On the grill. Need I say more? 8. Hot Dog on a Stick with Queso Sauce. What’s better than a juicy hot dog? A juicy hot dog ON A STICK. And move over ketchup, queso sauce is the new sheriff in this town. 9. Fruity Lemonade Pops. These beautiful pops taste like summer on a popsicle stick. And we’ve got a secret ingredient that makes them no-drip treats! 10. Lamb & Vegetable Kabobs. I know what you’re thinking: Yes, you CAN cook lamb. Think of it as an easy version of DIY gyros. 11. Angel Lush on a Stick. A handheld version of the classic layered dessert. But wait, there’s more: A cool, creamy dipping sauce. 12. Bacon-Wrapped Shrimp Kabobs with Orange-Chipotle Sauce. Sweet AND spicy? Shrimp AND bacon? Yes. Yes, we did. And we’ve got even more skewered selections on our kabobs page. The only question now is what to do with all the skewers you’ve used…. Homemade selfie stick, anyone?